I don’t like Daylight Saving Time. This is not just a personal opinion, but also my professional one, because I know how disruptive even minor changes to the sleep-wake cycle can be – to mood and emotion regulation, memory and cognitive function, as well as overall health. Sleep is foundational to good mental and physical health, and most of us aren’t getting enough of it, which contributes to increased rates of vehicle accidents, as well as diabetes, obesity, addiction, anxiety, and depression. Most people find it harder to get up one hour earlier, as we did last week, than one hour later, as we do in the fall. It’s also more challenging to make yourself feel sleepy one hour earlier in the evening, versus staying awake longer. The alarm clock may force you awake in the morning (if you don’t just sleep through it) but there’s no corresponding device to force you to fall asleep. As a result it can take a couple of weeks to fully adjust to the time change and catch up on sleep. You can read more about the origins of Daylight Savings Time here, but now I’d like to focus on sleep – why we need it, what keeps us from getting it, and how we can improve our sleep habits. 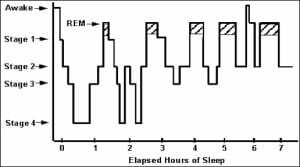 Notice that most deep sleep (stages 3 and 4) occurs in the first half of the night, while REM and light sleep alternate in the second half. It’s easier to awaken from a light sleep stage than a deep one. As we age, we spend more time in light sleep and less in deep (children spend most of their time in deep sleep). While our conscious awareness is turned off during sleep, and some systems slow down – like those that regulate movement – other body systems become more active. These include the immune system, so lack of sleep lowers your resistance to cold or flu viruses, and leads to being sick longer. Other restorative benefits of sleep include hormonal balancing, removing toxins, and regulating your metabolism. And although scientists still don’t know exactly why this is true, if people or animals are totally deprived of sleep, especially REM sleep, they die within weeks. 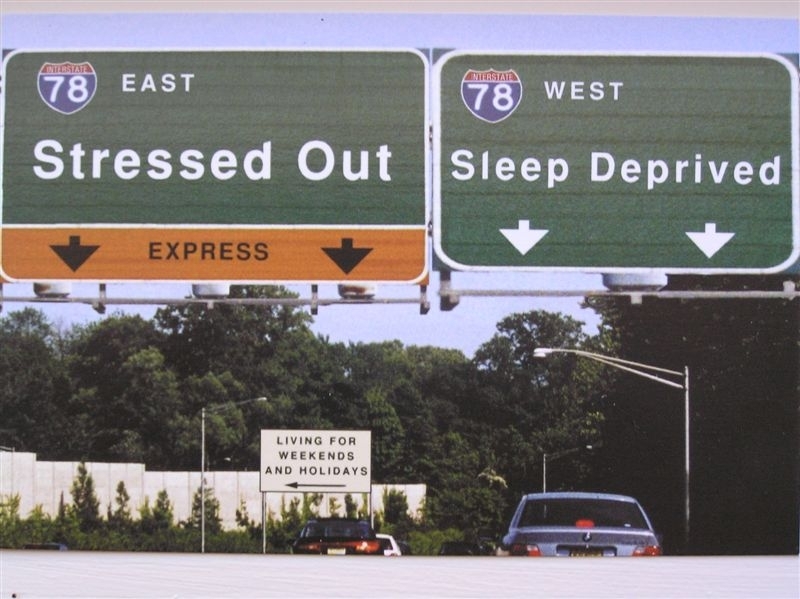 Even short periods of sleep deprivation have negative consequences for health and mental health. In one study, healthy young men who were allowed only 4 hours’ sleep a night for 2 nights reported a 23% increase in hunger; similar studies have revealed that restricted sleep ramps up production of hormones that stimulate appetite, and increases the risk of developing type 2 diabetes. Other studies have demonstrated that even brief sleep restriction leads to an increase in negative thinking patterns as well as low mood. If sleep is so essential, why is it so elusive? According to the National Sleep Foundation, adults ages 18 to 65 need an average of 7 to 9 hours of sleep per night. However, in surveys conducted by the National Institutes of Health every few years, about 35% of adults report getting less than 7 hours a night. Alarmingly, 38% report nodding off during the day at least once in the previous month, and 5% report they’ve nodded off while driving! Reported rates of insomnia and other sleep problems have steadily increased over the last hundred years or so, which scientists attribute to a combination of factors (people have migrated from rural to more densly populated urban areas, lead busier, more complicated lives, and work longer hours in brightly lit buildings) but clearly, exposure to artificial light is a key factor. What can you do to improve sleep without drugs? The rate of prescription sleep medication use has nearly doubled in the last decade, with higher use among women, older adults, and those who seek mental health treatment. (There is an insightful analysis about these trends in this Huffington Post blog, Who Is Taking Sleeping Pills?) These medications are intended for short-term use, can have unpleasant side effects, and disrupt normal sleep phases, especially REM sleep. What works best is to establish healthy habits that promote sleep. The one habit that will give you the most benefit: Establish, and stick to, a regular sleep-wake cycle. The practice of skimping on sleep during the school or work week, and then hoping to catch up on the weekend, is an unhealthy one. When you keep changing the time you go to bed or get up, it interferes with your body’s natural ability to self-regulate, to wake itself, and to fall asleep easily. Ideally, you should awaken and go to bed at roughly the same time every day, or at least most days. This helps to set the body’s internal clocks that regulate things like metabolism and mood. The second most beneficial habit: Turn off all screens (television, computer, tablet, phone) at least an hour, preferably two, before bedtime. The blue light that emanates from our devices interferes signficantly with our natural Circadian rhythm. Scientists have recently discovered that our internal “master clock” is much more sensitive to light on the blue end of the spectrum. So if you must use your devices at night, at least block the blue light with a special filter or amber-lens glasses. To read more about this, see my article Clock genes, manic mice, blue light, amber lenses. Create a restful sleep environment. We sleep best in a room that is dark, quiet, and comfortably cool (60 to 65 degrees F). Because the body’s temperature naturally drops in the evening just before bedtime, you may be tempted to bump up the thermostat, but it’s better to just dive under the covers and relax into the coolness of the sheets. Electric blankets can be used to warm the bed, but shouldn’t be kept on all night. Down comforters work best to hold in body heat at night. It’s important to have a mattress that supports the spine in its natural curve, and pillows that can be adjusted as you shift positions during the night. Everyone has different preferences, but personally, I don’t think memory foam or the number system beds are worth the extra money. Avoid these things in the hours before bedtime: Stimulants, including coffee, black or green tea, colas, chocolate, energy bars, spicy food, and some cold/allergy medications. Alcohol in all forms. The traditional “nightcap” may make you drowsy quicker, but once the alcohol is metabolized, in 3-4 hours, you’ll pop back awake again and find it harder to get back to sleep. You should also avoid intense, aerobic exercise, TV news, and arguments with family members within 3 hours of bedtime. Try adding these sleep promoters: Herbal tea, especially containing valerian or chamomile. I use a valerian-peppermint blend, with a little honey. If you must snack before bed, eat lightly, of foods that contain tryptophan – milk, bananas, turkey. Some people like a mug of warm milk, with a dash of cinnamon. Other things that help to promote sleep: a warm – but not hot – bath, dim lights, soft music, gentle touch or massage. And some form of prayer or meditation. Some people find that taking melatonin, which is naturally produced by the body, helps, but it should be taken in the smallest possible dose (I use a 1 milligram sublingual tablet). Sleep On It! Robert Stickgold in Scientific American, October 2015. The Clocks Within Us. Keith C. Summa and Fred W. Turek in Scientific American, February 2015.